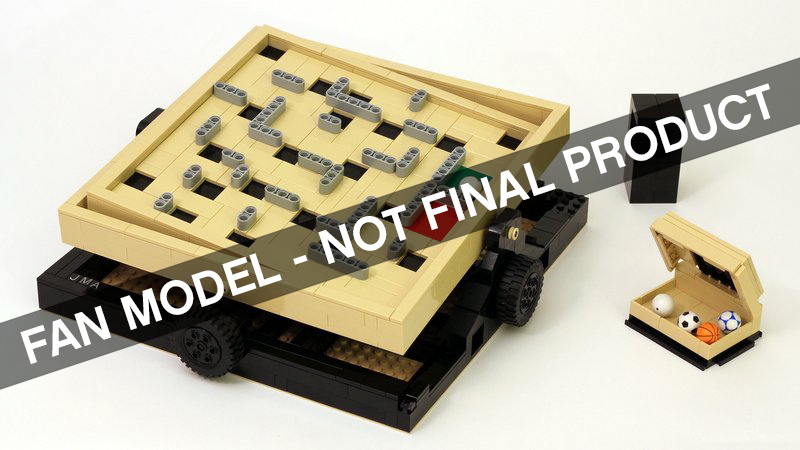 Like most 'LEGO Ideas' products it's no exception that it's also very similar to the original submission besides the Technic walls being replaced with system bricks. The source claims it might include a 32x32 baseplate, however they are uncertain with that aspect of the product. I first discovered and supported this project during it's early days towards 10,000 supporters so you bet I cannot wait to see the final concept! Always enjoy Lego Ideas. Will likely get this as well. Can't wait to see if they will be producing any other sets this year. 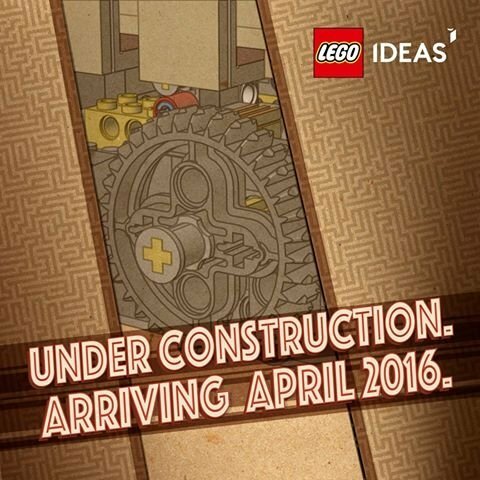 It sounded promising in a more recent Lego Ideas blog post but they haven't released anything further that I am aware. I'm probably alone but I think this is the worst Ideas set yet. Play value will be exhausted very rapidly and it's not a display piece. $70 seems insane. I was also an early supporter of this project and can't wait to see it. My grandpa had a maze like this made of wood, which we really enjoyed as kids. I'm really interested to see the mechanics. Probably not alone but I disagree. This is a great Ideas set. The mechanics will be interesting to learn and build. You can also customize the maze which will be fun. Simple concept with lots of possibilities. Personally I prefer this kind of Ideas set over the licensed ones which are nothing more than collectables. I agree with it being over-priced. I could see a traditional hand-made wooden maze going for $70. But a plastic one you have to assemble yourself? Not for me. Oh I totally agree it makes a change from the licensed sets (TBBT vignette being the worst example) but this I just don't like. Personal preferences and all that. There are much stronger sets coming in that $70-ish price bracket too. maybe the maze will look more exciting than on the pictures. I think the original creator showcased a couple themed ones. They are plenty more than collectables. They are play sets too. You can debate the "playability" of a set like The Big Bang Theory, but primarily it's designed to be built and then put on a shelf. The Maze set is more with what I envision an Ideas set being. I remember when these came out in the 70's early 80's. I got bored with them quickly back then, and that was in the days when there wasn't a billion other things vying for my attention like there is today. Like many ideas sets, this doesn't cover new ground, but rather is fueled by nostalgia. Wow man, you are old ; ) No wonder you're so cranky. Is The Lone Ranger anything more than nostalgia? Cowboys and Indians in the 21st century? Really? And that went over like a lead balloon. I don't see this set fueled by nostalgia any more than anything else today. It's a classic toy that now will come in a customizable Lego form. At least it gives kids something to build that resembles something that functions from an engineering standpoint. Nostalgia sells nowadays. Look at The Force Awakens. But I don't see this as nostalgia. It's a classic toy that you can now build and customize your own. Did you even bother to look the Ideas page for it? Do we really need another set based on a classic tv show or movie? I mean I enjoyed Ghostbusters back in the day and it still holds up today but I have little desire for a giant Lego built firehouse much less the $50 Ideas set. And a $270 60's Batman set? We're suckers for sure. LEGO Maze… under construction. Arriving April 2016! Very cool idea. Looking forward to seeing instructions to see if I can build it from a couple of Ramses Pyramids and other parts culled from my UCS Alderaan (post Death-Star) set. Looks pretty cool. I will be buying one to build and play with for sure. Not for me at all, but I'm sure a lot of people will have fun with it. At second glance, I do think $70 is too much though, so I will be looking to get it at $50 or less if possible. Or just sourcing the parts. No way there are $70 worth of parts in this one. ^Not that I think it shouldn't be less, but I doubt you could source the 770 parts for anywhere near that. It's 30 studs square, multiple walled and coated in tiles. While there may not be anything in there particularly expensive there doesn't look to be much that is actually that cheap either - look at the number of decent length 1xX bricks for example. Probably priced too high, but If I cut back my burrito intake by two that will make up for the $20 up charge on this set. Definitely getting my hands on this as I have fond memories of NYE in NH playing with a real maze labyrinth. 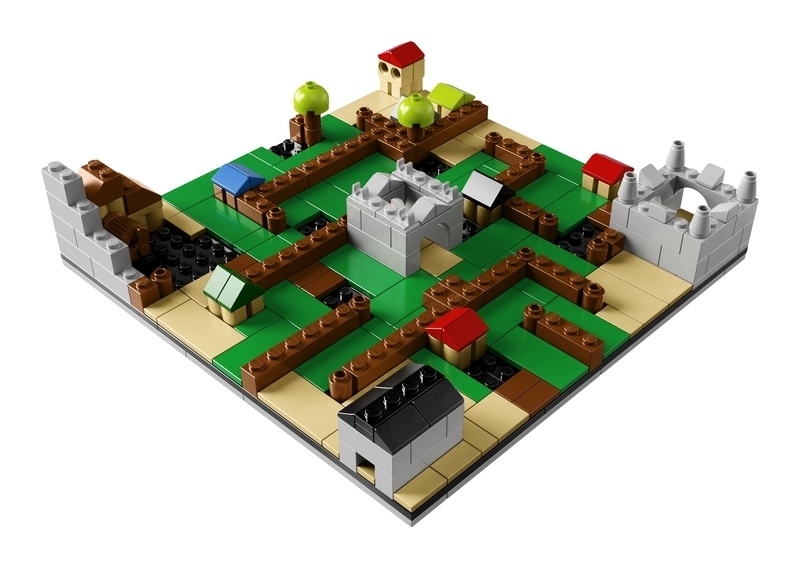 I made something like this about 20 years ago by sticking a load of pieces to a baseplate. There were no fancy mechanisms though, just tilting by hand to move a marble around. Initially thought the Ideas project was rather dull, but now that the official version is out I can't help feeling a wee bit interested. The mechanisms are pretty cool after all, and it would be fun to play with. But then I'll probably get tired of constantly rebuilding the maze, or just start building ridiculously difficult mazes to torture any visitors to my home with. I can understand why people are complaining about this set being an underwhelming concept however I personally feel that is the beauty of this concept. I just wish they continued that SNOT pattern using the 2x4 tiles across the whole maze to give the sides more character and depth. I'm glad they at least included one alternative maze which is what we were all concerned about. This concept screams modification and creativity towards the consumer; I cannot wait to make more maze combinations and possibly update the wooden sides as mentioned above. Judging the difference between the price and piece count of #21301 Birds (another non-licensed LEGO Ideas product with no Minifigures) I'm guessing the UK price will be £59.99. I reckon that is a fair price given it includes a 32x32 baseplate. Does this set come with any exclusive minifigures? Variety is the spice of life. I'm happy that TLG is willing put out less conventional sets. I know plenty of my engineer friends (the egg-heads, not the train drivers) that wouldn't normally spend a moment fussing over Lego, definitely fussing over one of these. No helicopter, sausage, lighthouse, Landspeeder, re-tread, Police/Fire HQ for this one. We could always incorporate a few of those elements into the maze seeing you will be missing them otherwise! I can't tell on the box image but the castle layout makes it look like the ball just falls down off of a flat plate onto a baseplate, not down a hole. Is that right? @Final_Sign Yes there are no actual holes for the ball to fall through. I think (if i buy this) my first alteration will be to buy some arches, and build a second storey, to create a multi-tiered maze. Hopefully it's possible. Plus I would imagine the added height of the upper level would make it that little bit more challenging (would expect ball to move faster, as tilt would be exaggerated). Perhaps even a third or fourth tier, leaning tower of pisa style, might make for an entertaining maze game, with holes to drop down/out resulting in fewer 'points' scored. ^How will you see the ball on the lower levels? For the record I only ask as it sounds awesome. This is awesome and makes me want the set even more. While I feel it is overpriced, it is over 700 pieces for $70, which is a good amount of parts for that price nowadays. I will be purchasing this because I am interested in the mechanics of it. @Catwrangler Good question to which i don't have an answer. It's just an idea at the moment. Until i have a set in my hands and start messing about with it, i won't really know what's possible, or how much extra weight it can handle. Hopefully it can cope with an extra few levels. If so, one could even create wider levels, or mini levels. @legomatt I love the idea of the duplicate levels, with the ball being hidden! ^I quite like the idea of covering just part of the maze without a duplicate, just a blind section without holes to fall in but no way of knowing the route through (other than you built it of course). I'm getting more excited about this set by the day. It really lends itself to rebuilding and doing rather than just displaying which the other ideas sets have been for. Still overpriced, but I agree it has great potential. I'm just going to try to resist it on day one and assume they follow what they did with Dr Who and make it available through other retailers. Dr Who was 25% on Amazon not that long ago, which would make this a whole lot sweeter. I still haven't seen a UK price, I'm still hoping for £49.99 rather than £59.99! ^Have any unlicenced ideas sets been available through other retailers though? Research Institute was, and Birds still is available at Amazon proper (not 3rd party). The Birds set is still available through Barnes and Noble's online store, and my Toys R Us was also selling it. For a this side of the water answer - no, not that I am aware of. But then we haven't seen an unlicenced since Birds and the line has grown in popularity a lot since then. We are starting to see a shift away from exclusive sets on the whole really, more and more of the vignettes, polys etc starting to turn up. Not to mention a certain poultry clad minifigure at a major supermarket. Times are changing and I'm hopeful it will be good for ideas.